Amanda ~ All of the dancers filled out random questions about themselves. The answers are below in their photo bios! If you had $1000 that you had to spend, just on yourself, and were not allowed to spend it “sensibly”, what would you buy? If you had to run out of your burning house, what would you grab? My life up until this point! It's had some big ups and downs, but I'm still here! What is your favorite costume item that you own? When did you start dancing? What inspired you? 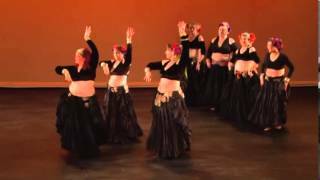 I started belly dance about 6 years ago, doing cabaret for only a few months. I was youtubing belly dance videos shortly after and came across a Zoey Jakes video of tribal fusion...MIND BLOWN. After that I switched over to tribal style, doing classes and private lessons in fusion and then getting to join Prairie Caravan and doing ATS. I love them both. I'm inspired every time I dance by the beauty of the people I am dancing with, the art of the dance itself, and the things you learn you can do that you never knew! Favourite book or movie, and why? Any kids; pets; significant others that you’d like to mention? I own a miniature schnauzer named Petal, a standard schnauzer named Candle, and two quaker parakeets named Herbie and Flip. I wanted to be a veterinarian, but turned out I was not very good at math. It turned ok though, because between two parrots and two dogs, I still get to spend a fair bit of time in their offices, just not quite as I wanted it, haha. Ive being focusing more on my artistic endeavors, which were on the back burner for years while I focused on school. I love oil paint, and always have a few works on the go, I also have started working with clay and am about half way through I piece I plan to get bronzed. The focus of my my art is mostly horses, although Ive been sketching more different subject matter lately. My goal for the new year is to do at least two pieces that have subject which is outside my comfort zone (so paintings that are not of horses! ).